Ubisoft's Jade Raymond explains how to walk the line between controversial and offensive. The mainstream game industry is going through a kind of awkward, drawn-out puberty. Much like your average teenager, it wants to talk about the big issues, but its voice keeps cracking, and it's easily distracted by breasts. That hasn't stopped a number of developers from tackling topics like religion, war, torture, sexual assault and drug abuse in their games, with mixed results. Talking to Official Xbox Magazine, Ubisoft Toronto managing director, Jade Raymond, outlined her stance on covering controversial topics. "At Ubisoft we have studios all over the world, and there's a very fine line between what you think is interesting and what someone else may think is not respectful - you don't want to offend anyone," she said. 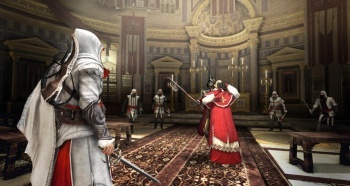 As a producer, Raymond worked on Assassin's Creed, a series that offers a less-than-sympathetic take on religion. Her team at Ubisoft Toronto is currently working on Splinter Cell: Blacklist which, according to this gameplay trailer, has Sam Fisher torturing wily foreigners for information. "I do think that certain topics, in order to be treated properly, do need a certain level of polish and quality," she said. "There are certain topics that we are able to just jump right into, and one that a lot of people have tackled wholeheartedly is environmentalism. That one doesn't feel so touchy because we can make a statement, we can simulate stuff and say 'this is what's going on.'" "We could make a game about that topic very easily and still make it a big success. Others, I agree, would be better to try in indie games and maybe the statement or experience can be better expressed that way." Recently, Square Enix sparked controversy with its trailer for Tomb Raider, in which tiger-hating protagonist, Lara Croft, faces what Crystal Dynamics describes as "close physical intimidation." Online arena game, Smite, has been criticized by Hindus and Christians alike for its portrayal religious deities. And let us not forget Six Days in Fallujah, a third-person action game from Atomic games that was canceled after a media outcry deemed it well ... too relevant, for lack of a better term.